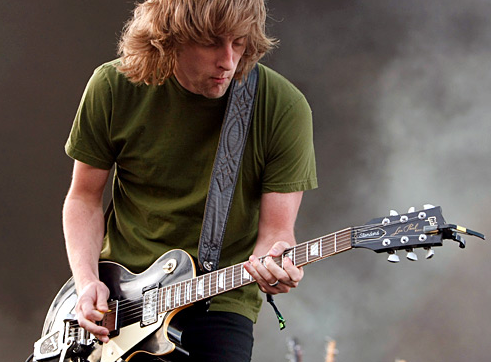 iconic guitar.com: Carl Broemel - "Blacky"
"My black 1988 Les Paul Standard is definitely the most special guitar in my collection. 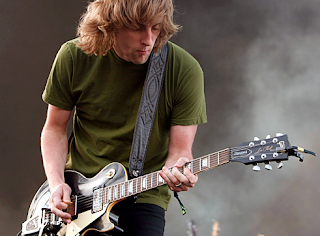 I've been playing it for 14 years, and have replaced the tuners, frets, pickups and pots, and eventually added a Bigsby (so I could pretend to be in Crazy Horse)." "I guess I've just played it so much, and used it to record so often, it's become the main thing that makes me sound like me. I once watched in shock as it flew out of my friend Mike's pickup truck and landed neck first on Indiana Highway 37. Hard. But somehow, Ol' Blacky lives to tell the tale."